The Supervisory Control and Data Acquisition (SCADA) system is a computerized system used to continuously monitor the process flow and operation of plant equipment. Data collected from the equipment located throughout the multi-acre facility (over 930 data points monitored) is conveyed via underground fiber optic cables to the operator’s control room. 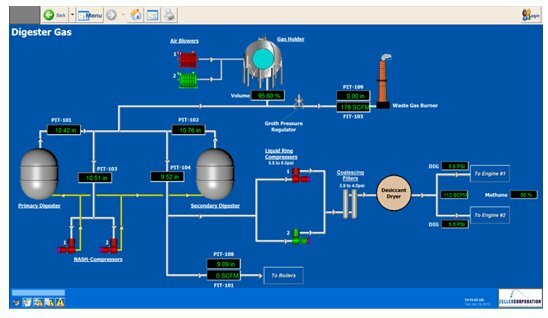 The SCADA system shows graphic displays of all plant process systems on a large computer monitor and provides the operator current status and maintenance history of all process equipment. The SCADA system also records equipment trends and generates alarms when equipment malfunction occurs. 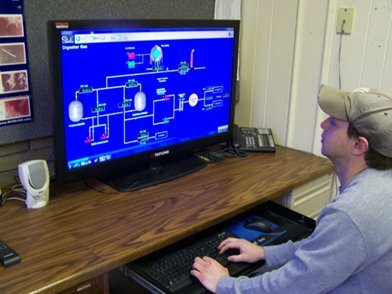 The SCADA system is fully accessible to authorize plant personnel to monitor the facility from remote locations.